Listen to Alexandra Olgin's story in this week's Health & Wealth Update. Even as the strong wind whipped signs out of their hands, about 50 people rallied on the steps of the Missouri State Capitol. Some of these people are recovering heroin addicts. Others had friends or family members die from heroin overdoses. They’re rallying in support of HB 296 – the 911 Good Samaritan Bill. If passed, the bill would give some legal protection to people who call 911 for emergency medical attention in cases of life-threatening controlled substance overdose. The bill would prevent the caller and the person who’s overdosing from getting charged with drug possession. Loretta Boswell is one of the 50 advocates on the steps of the Capitol on Tuesday. She says had this bill been enacted a few years ago, it might have saved her brother. Loretta Boswell’s friend Danyel Sapp is a recovering drug addict. Sapp says she’s gone through a life-threatening overdose. Sapp said heroin’s increasing prevalence in the streets of Missouri is probably because of its accessibility. Kathleen Kane-Willis is the lead researcher on the Roosevelt University study that highlighted Missouri’s increasing heroin overdose deaths. She helped organize Tuesday’s rally with Missouri Recovery Network. She said the bill is designed to only protect the overdose victim and the 911 caller -- no one else. In the drafted bill, that small amount is about less than three grams of a substance containing narcotics such as heroin, cocaine or morphine. Kane-Willis said the idea of narcotic abusers moving on without legal consequences might bother some law enforcers. Kane-Willis’ study found that Missouri’s drug overdose rate is ranked first in the census region – more than double of Nebraska’s rate, and almost double Iowa’s rate. At 13.1 drug overdoses per 100,000 individuals, Missouri’s rate is significantly higher than the national rate, which is at 11.9 per 100,000. Although we might think of heroin as a mostly urban problem, the study reported that in recent years, heroin overdose deaths have increased more in rural areas than in cities. State Rep. Brian Spencer (R-Wentzville) is the sponsor of the bill. Currently, the bill is in the House Crime Prevention and Public Safety Committee, waiting for a hearing date. Only about 10 other states have a similar law protecting 911 callers or victims when it comes to drug overdoses. In the Midwest, Illinois is the only one that has adopted it thus far. Local advocates are striving to get the heroin problem in Missouri under control.The Missouri Recovery Network and Roosevelt University in Chicago conducted a study of heroin use. They found more people sought treatment for heroin and opiates than for methamphetamines in Missouri. 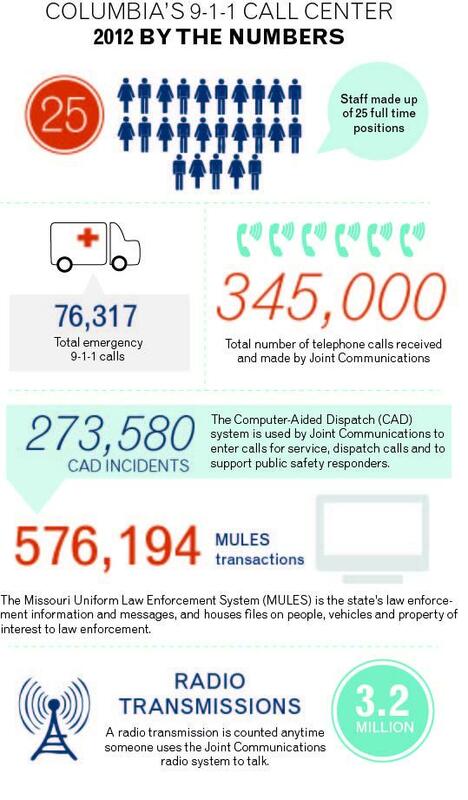 “Everyone is a walking 9-1-1 call,” says Joe Piper, Acting Operations Manager of the Boone County 911 Dispatch Center, also known as Joint Communications. Leaders at Joint Communications, located in downtown Columbia, say they are having trouble keeping up with the increase in calls. “It’s a good thing, in some ways, but it’s a bad thing in other ways because an incident can overwhelm us very quickly with one call taker,” Piper says. And at the same time, they don’t want people to feel discouraged from calling 911.